Is This America’s Next Great Beer Town? In 1935, the Gottfried Krueger Brewery made drinking history by selling the first-ever canned beer, choosing Richmond, Virginia, as its test market. But the innovating spirit of the city’s brew scene didn’t settle, leaving the town far behind in the race for craft dominance. That’s largely because prohibition-era legislation forbid breweries to sell their product on-site unless they had an attached restaurant— an economic hurdle for smaller brewers. The tide shifted with the passage of State Bill 604 in 2012. The law allowed retail sales of beer and sampling on the premises of Virginia breweries. Which is how in just five years, Richmond has transformed from a relatively dry city into a micro beer mecca. Now, Richmond has transformed into a haven for beer lovers—with more than 20 breweries producing quality product of all varieties—and its own thriving suds-based economy that encompasses restaurants, on-site tastings, and beer tours. The city ranks as one of the top craft breweries per-capita in the country. Richmond local David Hunter started the Facebook group Fans of Virginia Craft Breweries with 50 friends shortly after SB 604 passed. It’s bloomed to more than 13,000 members, most natives of his home city. From the former Major League pitcher who opened a brewery at an old newspaper plant (Center of the Universe’s Chris Ray) to the garage brewers who graduated to retail (Ardent Craft Ales’ Tom Sullivan and Kevin O’Leary) to the son of Vietnamese immigrants who turned his family’s restaurant into one of the best beer bars in the nation (Mekong’s An Bui), there are as many interesting stories in Richmond as there are varietals of beer. Experimentation is a hallmark of the Richmond craft brewers, which means it’s hard to pinpoint a specific taste of the city. You’ll get the dank hops of the Falcon Smash IPA from Triple Crossing Brewery, the chocolate and espresso notes of Center of the Universe’s El Duderino stout, and the Hawaiian Punch-inspired tartness of the Never Aloha Gose by The Veil. In order to experience it all, a beer tour might be the best way to sample Richmond’s wares. 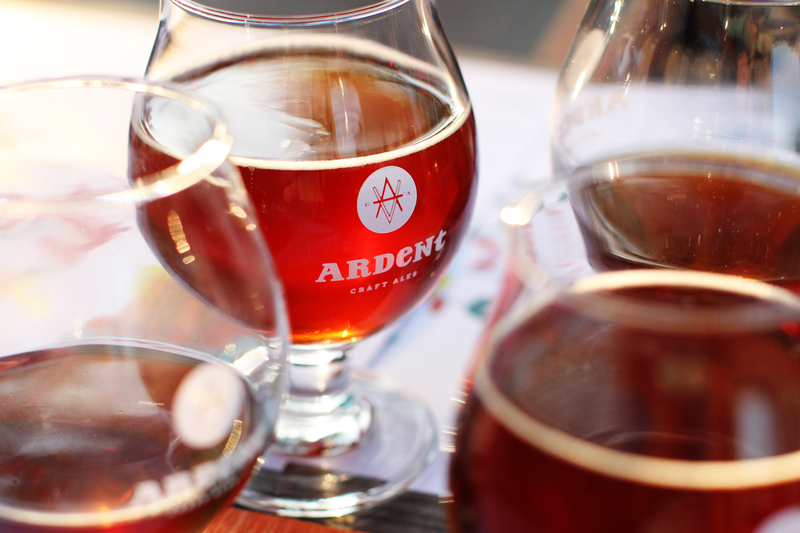 You can take an official tour via bus, or saunter around Scott’s Addition, the onetime industrial enclave that has become the epicenter for the city’s craft explosion, with five breweries and several cideries in the neighborhood, including Ardent, The Veil, and Isley Brewing Company. While some brewers worry about oversaturation, most feel that the quality of the product being produced throughout the city will help Richmond continue to develop into one of the major craft beer capitals in the United States.